PROBA-V’s Mission Exploitation Platform (MEP) complements the PROBA-V user segment by building an operational Exploitation Platform on the data and derived products to bring the users closer to the data. The MEP offers multiple online applications. One of these is the Time Series Viewer (TSV). It allows you to explore the PROBA-V Time Series for specific regions, incorporating data such as rainfall. 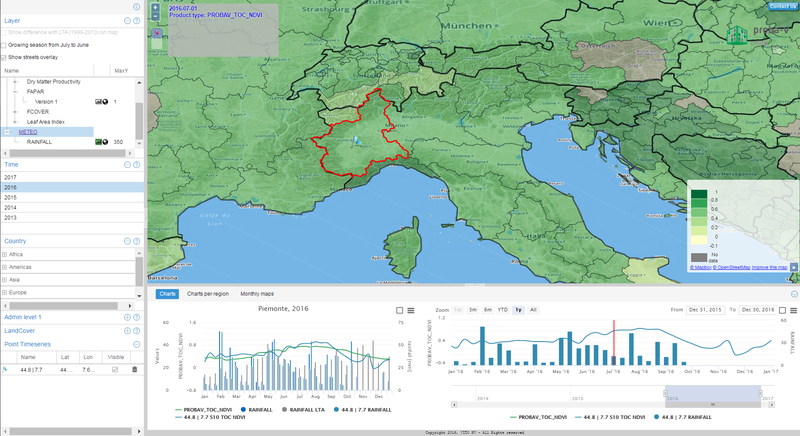 Since March 2017, the Time Series Viewer has allowed you to view time series for individual pixels for PROBA-V 300 m TOC NDVI and Chirps rainfall data. On-the-fly data analytics are applied to show you the exact information you need, not just the pre-computed values for pre-defined regions. The next step? Supporting user-defined polygons from the Web UI. The pixel and polygon support can be used via our web client, but you can also use the RESTful Web service. This service now supports both, single pixels and polygons, and can be integrated into your applications. In the future more data will be added e.g. vegetation layers from the Copernicus Global Land Service. Besides the Time Series Viewer, PROBA-V MEP also offers a Virtual Research Environment (VRE). Researchers and developers from across the globe can request a VRE with access to the PROBA-V and SPOT-VEGETATION data archive. It also offers a powerful set of tools to work with the data (e.g. SNAP Toolbox, GRASS, GIS, QGIS). With the VRE it is also possible to develop and test applications (R, Python or Java). On simple request from our website, we pre-configure your VRE with all the tools you need to facilitate your research or project. Since February 2017, you have also been able to access the full reprocessed archive. Note that for PROBA-V as well as the Level-2A data, is now available on the platform. For more information, please visit https://proba-v-mep.esa.int.